Indianapolis Motor Speedway is the home of the Indianapolis 500, the best known auto race in the world, and the site of numerous automotive breakthroughs. In 1908, Indianapolis auto industrialists Carl Fisher, James Allison, Arthur Newby, and Frank Wheeler decided that American auto makers needed a proving ground for their new machines. They bought 320 acres of farmland, just across 16th Street from Fisher’s and Allison’s Prest-O-Lite auto headlight plant. The group also collaborated in platting out the Town of Speedway at this time. In 1909, they laid out the 2.5 mile oval track in its present configuration, but with a macadamized surface. Racing began that year. By the next year, the owners decided to pave the track in sturdier paving bricks, now the trademark of the Indianapolis Motor Speedway. One yard of exposed brick remains at the start-finish line; the millions of others are under asphalt that is periodically resurfaced. The basic course configuration with its two and one half mile curved track, grandstand and pit layouts, and garage arrangement is very similar to the way it was in 1909. In May 1911, the original investors began offering an annual 500 mile sweepstakes race – the Indianapolis 500. Ray Harroun won the first Indianapolis 500 in his locally built Marmon Wasp racer. 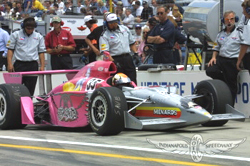 While many commentators have remarked on recent rookie Danica Patrick’s “weight factor” in Indy style races, Harroun was the first driver to openly use weight to his advantage at the very first Indy 500. He competed without the then obligatory mechanic on board to avoid extra weight. Through decades of competition, the Indianapolis Motor Speedway served as a test bed for auto innovations. Everything from rearview mirrors to front wheel and all wheel drive were tested under race conditions at Indy. Overhead cams, lubricants and oils, turbochargers, tires, and other variations of auto products also have been proven here. As the original owners died, experienced financial setbacks, or turned attention to other pursuits, those remaining decided to sell the now famous track. In 1927, World War I flying ace Eddie Rickenbacker bought the Motor Speedway and owned it until 1946, when the current owners, the Hulmans, bought the track. Faced with a deteriorated facility that had remained closed during much of America’s involvement in World War II, the Hulmans began revitalizing the buildings and grounds through repair or replacement. The race itself was promoted and drew the attention of a new generation of racers. Race day on Memorial Day weekend draws well over 250,000 spectators. Indy cars have changed drastically through 8 decades of auto racing. Visitors can experience this transformation at the Indianapolis Motor Speedway Museum. From Harroun’s first winning car to the ‘50s front wheel drive roadsters, the ’60 rear engine models, and modern ground effects cars, it’s all here. Over 30 of the cars are historic vehicles that actually won the Indy 500. 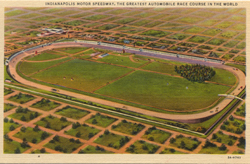 Indianapolis Motor Speedway, a National Historic Landmark, is located on the west side, at 4790 W. 16th St. Click here for the National Historic Landmark registration file. The track and museum are open 9am to 5pm (EST) 364 days a year, closed Christmas Day. Extended hours are offered during the month of May. Museum phone is 317- 492-6784. Visitors can tour the track by van. Contact the museum for more information. During a set day each May, visitors can drive their own cars on the track or bring the family to a practice day, qualifications, or a race event at the Motor Speedway. Consult the Indianapolis Motor Speedway website for more information about races or other events. INDYGO bus line from downtown: #25 West 16th Street, disembark at Georgetown Rd.